When a British film is called highly-anticipated and shown on an international stage, the clarion call of "the British are coming" is never far behind. As the curtain-raiser to the Venice Film Festival, Atonement, only the second feature from 35-year-old director Joe Wright, is generating such interest. Critics have reacted warmly to the film, based on Ian McEwan's novel, and some have even been bold enough to talk about Oscars, not least for the central performance from Keira Knightley. The actress says she was very keen to work with Joe Wright again, who steered her to an Oscar nomination in her role as Elizabeth Bennett in Pride and Prejudice. Knightley admits she read the script - about a couple who are divided by class but devastatingly intertwined by a false accusation - before she tackled the novel. "I eventually read it a week before we started filming. My character, Cecilia, is slightly different in the book. There is a maternal softness to her which I certainly didn't play," explains the 22-year-old actress. Knightley, who has become a major film star, has mixed feelings about the culture of celebrity and being famous - which another high-profile role is likely to increase. "Once you become famous you get completely dehumanised. I think people forget there is a person in there trying to deal with it," she says. "Partly the way you deal with it is by not reading, not looking and seeing any of it and burying your head in the sand. 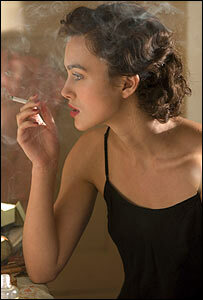 It is the only path to sanity," adds Knightley. She hopes that cinema-goers will "bawl their eyes out" when they see Atonement, and dreams that the Venice Film Festival, where it will compete for the prestigious Golden Lion, will mirror the progress of The Queen last year - which culminated in Dame Helen Mirren winning an Oscar. Knightley's co-star in the film, James McAvoy, has built an impressive film CV of his own, including a role in award-winning The Last King of Scotland. But he is resigned to the fact that his glamorous female lead will steal all the headlines. "I don't mind that Keira will get a lot of attention. She deserves it. She is incredible in the film. "I'm very, very lucky to be involved in this film and it was the finest professional experience in my life. I'm very fortunate," adds the actor. Director Joe Wright, who is already working on his next feature, says he felt "fear" when he discovered Atonement would open the Venice Film Festival, but adds his career does not rest on the accolade, or box office takings. But he admits to being prepared for the prestigious event's red carpet, having already purchased a new Prada shirt for the occasion. 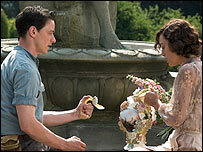 Atonement premieres at the Venice Film Festival on 29 August. It opens at cinemas in the UK on 7 September.